Marathon training requires very little equipment, but the right shoes are a must-have. With 350+ miles on my shoes, it was time for replacements. Although I’ve been very satisfied with my Mizuno Wave Nirvana 8’s, my new running form and pace had me wondering if I’d benefit from something less hefty, with more of a minimalist rise. Even though I haven’t completed the gradual shift to barefoot running, my form has definitely incorporated the newest theories and mechanics associated with barefoot running. So, off to Boulder Running Company I went, with my stinky and dirty running shoes on, and an open mind to hear some recommendations from the experts. Of course, I had planned to take my time trying each pair on the treadmill with video capture and analysis of my foot strike. I was surprised a bit to learn that I might not be benefiting as much from my custom orthotics as I thought. Without them, and with a neutral lightweight shoe, I wasn’t over-pronating. In fact, with my mid-foot strike, my form looked pretty spot-on in the video…with no orthotics, and no motion-control running shoe. 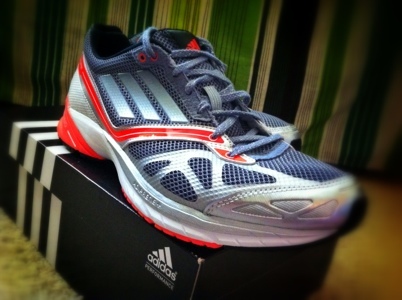 So, here we go…I’ll start using my new shoes with no orthotics for shorter workouts, and see how they do. The new shoes are Adidas Adizero Tempo 5, and are much lighter than the Mizuno’s. It’s a different ride, and I’m excited to see how they do! Mizuno also offers a variety of other choices in Mens Running Shoes. Take a look at the headings of each group of running shoe to shop by the level of pronation you need. If you’re saying you’re an overpronator, the Wave Alchemy 12 will provide you with a higher level of support. Either way, good luck out there!